I am so happy to be a part of it's celebration. We all deserve some real relaxation and pampering once in a while. As I get pampered, I am also helping either of the three organizations. More than just experiencing real pampering, everyone who participated in the National Pampering Day knew they are going to feel good inside and out. Each guest was asked which partner organization of Nailaholics they would like to support prior to getting pampered. Those who chose World Vision supported the rehabilitation of Marawi City. Some were able to help protect our country’s rich but threatened marine and coastal resources by supporting Save Philippine Seas and others supported The Philippine Animal Welfare Society (PAWS) in preventing animal cruelty and promoting the adoption of stray dogs and cats. 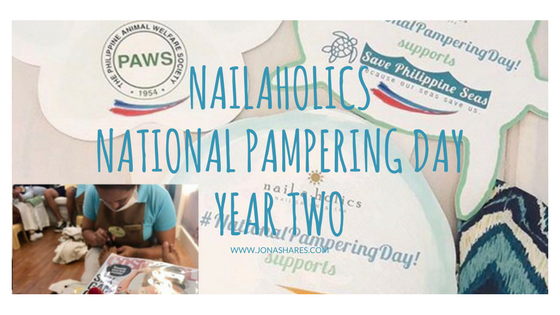 Thank you Nailaholics and see you again next year! For more updates and information, you can visit www.nailaholics.com to check their services and find the branch nearest you. Check their Facebook Page Nailaholics Nail Salon and Spa, Twitter @_nailaholics and Instagram @_nailaholics.